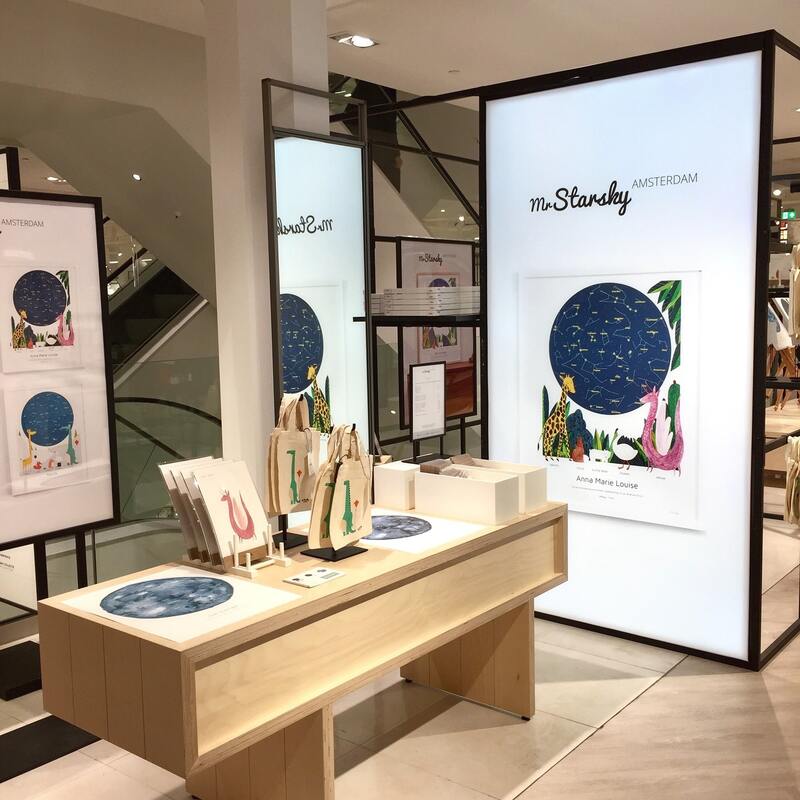 MrStarskyAmsterdam opens pop-up STUDIO in the Hudson’s Bay! This fall MrStarskyAmsterdam got invited to open a pop-up STUDIO in Hudson’s Bay for 4 weeks straight. During those 4 weeks, you can see the personalized starry sky posters from up close in two different cities: Haarlem and Amersfoort. It’s even possible for you to order your poster directly from there, and to purchase unique, cool merchandise! MrStarskyAmsterdam is known for creating unique posters on which you can capture the position of the stars on a special day, for example, a birthday or an anniversary, and eternalize that one special moment. All four designs are going to be on display at the pop-up STUDIO, in Haarlem from October 2nd – October 15th, and in Amersfoort from October 16th – October 29th. There is, also, a wide variety of accessories available, ready for you to buy, like mini-posters, postcards, and little canvas bags! Hudson’s Bay STUDIOS concept are unique pop-up shops where visitors can experience something by tasting, feeling or smelling whatever is on display in the STUDIO. The brands that get selected by Hudson’s Bay to showcase their products in the STUDIO are new and/or innovative. At MrStarskyAmsterdam we believe that you are never too young to discover the world around you and the sky above you. That is why the products of MrStarskyAmsterdam contribute to nurturing creativity and curiosity: every child his or her own magical sky full of stars and related illustrations.